Are you tired of paying high energy bills and looking for ways to reduce the costs? Consider adding energy efficient window coverings. According to data at Green Houston, heating and cooling accounts for 58 percent of our energy used in Texas. Installing new energy efficient window shades, shutters or blinds is a quick and easy way to lower your heating and cooling costs while also increasing your privacy and enhancing the beauty of your home or office. During the summer, uncovered windows are a major source of solar heat entering the home as well as loss of cool air from inside. In winter months, heat escapes through uncovered windows. Without energy efficient window coverings, you could lose as much as 50 percent of your home’s heating and cooling. As a result, your HVAC system runs more to make up for the loss, increasing your energy bills and reducing the life of your system. Quality window coverings can help conserve energy by providing insulation, solar heat control and daylighting. The most energy efficient window coverings today are shades with the honeycomb construction. Read about the energy efficient design of honeycomb cell shades. 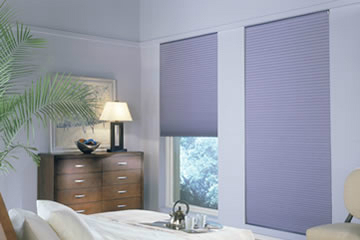 Houston Blinds For Less offers a variety of honeycomb cell shades, including ones with motorized operation. If you are more concerned about reducing solar heat gain on hot days than conserving heat in your home, and you prefer less expensive window coverings, consider interior blinds. According to the US Department of Energy, highly reflective window blinds closed or lowered on a sunny window can reduce solar heat gain by about 45 percent. Plus, the flexibility of the slats on blinds enables you to redirect incoming sunlight to a light-colored ceiling, which diffuses the light without gaining much heat or glare. You can find a wide variety of vertical and horizontal blinds, including easy-to-operate blinds with motorized operation, at Houston Blinds For Less. With motorized operation, you can control your blinds with a wireless remote or automatically with a programmable timer. For generations people have used wood shutters to control the incoming sunlight as well as cold air, and plantation shutters remain a popular choice for energy-efficient window coverings today. Solid shutters provide energy saving in summer and winter by decreasing both heat gain and loss. High-quality, tight-fitting wood shutters provide improved energy efficiency and can significantly increase the value of your home. The most energy efficient shutters, however, are the poly shutters. Also called faux wood plantation shutters, poly shutters are easy to maintain and often recommended for high humidity areas. If you are unsure what type of energy efficient window coverings to select, submit the form provided to contact Houston Blinds For Less. An expert representative will welcome the opportunity to discuss the best window coverings for your applications, show you samples, and explain the options and energy ratings.